The Orcas Island Chamber Music Festival is dedicated to sharing music, musicians and music education with our preschools. This early childhood musical opportunity involves playing instruments, singing and creating musical stories, and provides a strong music-based foundation from which our young ones learn and grow. The Orcas Island Chamber Music Festival was proud to award four High School seniors with The Marilyn Anderson Young Musician’s Award, supported by the Thyra and Bud Anderson Advised Fund. OICMF Board of Directors Emeritus Marilyn Anderson, and OICMF Executive Director Leslie Rae Schmitz presented awards to Mikaela Hansen, Celestine Jensen, Emy Carter and Lisa Carter at the Celebration of Success ceremony on June 12, 2015. This annual $500 award for graduating seniors honors students who have demonstrated that music is an important element in their lives. Their music involvement could include singing, playing an instrument, composing, or recording of music. The award is named for founding OICMF Board member Marilyn Anderson and her dedication to music education. This tradition began in 2007, and has been a source of encouragement for music students, acknowledging the importance of their practice, performance, enjoyment and love of music. Congratulations Young Musicians! The Orcas Island Chamber Music Festival is pleased to announce the appointment of Leslie Rae Schmitz to Executive Director effective April 1, 2015. Most recently, Leslie worked with the University of Washington School of Medicine in Seattle as Director of Education/Membership/Pilot Funding with the Institute of Translational Health Sciences. Her responsibilities included overseeing a team of operations managers, technology managers and financial analysts, working together with faculty and administrators to deliver education and training events and programs. Her life-long attachment to Orcas Island began as a YMCA Camp Orkila camper, then as a staff member for ten years. She has been a full and part-time resident of Orcas Island since 1999 and held consulting appointments with OPAL Community Land Trust, San Juan County Domestic Violence and Sexual Assault Services, Orcas Island Parks & Recreation, San Juan Island Community Foundation and Frontline Call Center. Her husband Brian works for the Washington State Ferry system and they have a daughter, Vivian. Leslie holds a Master’s degree in Public Administration from the University of Washington Daniel J. Evans School of Public Affairs. She began her career in Washington, D.C. as the Special Assistant to the Senior Vice President for National Security Policy for Science Applications International Corporation. Her work with the U.S. Department of Energy/Defense Programs to restructure and realign national security programs and infrastructure at the end of the Cold War led to the receipt of the Hammer Award for Reinventing Government, awarded by Vice President Al Gore. Leslie’s expertise as a certified Project Management Professional (PMP) has involved the successful management of events, programs and projects involving distributed work teams on local, national and international levels. She has provided operations, event and project management leadership and oversight in a myriad of sectors, including foundations, non-profit, technology, medical research, academia, capital improvements, human resources, financial and government. You’re a Piece of the Puzzle! Exceptional experiences happen when the pieces of a puzzle come together. – Guest artists trav el to the islands to perform. – Full-house audiences rise to their feet with spontaneous applause during the Festival season, Salon Concerts and community performances. – Hundreds of volunteers complement every donor gift through countless hours and needed skills. – Eager preschoolers greet Orcas Island Chamber Music Singing Pied Pipers each week and share a Tune-Up Summer Camp with Teaching Artists on Orcas and Lopez islands. – Generous in-kind and supporting business contributions augment what is possible. – You – our Donors – send gifts from both near and far. We’d like you to be a piece of our wonderful puzzle. And thank you for trusting us to put it all together with you in mind. 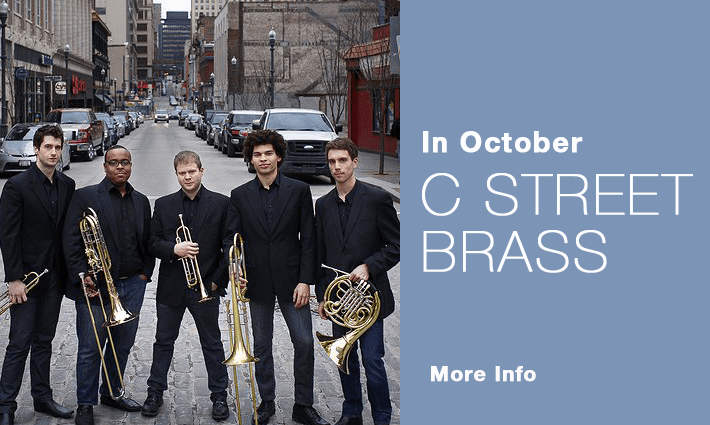 C Street Brass is the Ensemble in Residence at Carnegie Mellon University in Pittsburgh. Funding for these 2014-15 Musicians-in-Residence programs is from the National Endowment for the Arts, Orcas Island Community Foundation, Washington State Arts Commission, Monique Mead, Mimi and Slim Sommerville and the Gould Family Foundation. They’re called WindSync, a quintet of virtuoso players who show just how exciting a flute, oboe, clarinet, bassoon and horn can be. This fresh, energetic group will be the Orcas Island Chamber Music Festival Musicians-in-Residence the week of March 10th. The five members of WindSync will work with K-12 music students and teachers, offering skill-building techniques which focus on finding a group sound together, while providing enthusiasm and inspiration. In addition, the Quintet will conduct workshops with community musicians. Their busy week on Orcas will end with a Spirit Assembly for students. Based in Houston, WindSync has thrilled audiences nationwide with their unique approach to classical music. The Quintet specializes in creative and interactive concerts that inspire audiences of all ages, and are pioneers in unconventional performance practices. 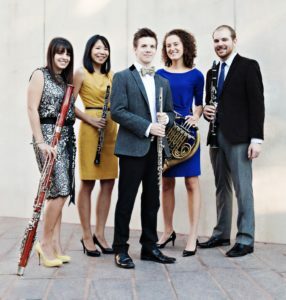 They have frequently performed in schools representing Young Audiences of Houston, an arts program which applauded WindSync for its “extraordinary ability to connect students, educators, administrators, and parents in a powerful and meaningful way.” Hailed by the Houston Chronicle as “revolutionary chamber musicians,” WindSync was winner of the 2012 Concert Artists Guild Victor Elmaleh International Competition. The Orcas Island Chamber Music Festival is thrilled that WindSync is bringing their talent and passion for education to Orcas schools in March. This project is underwritten by gifts to the Orcas Island Chamber Music Festival Music Education Fund. Orcas Island Chamber Music Festival is bringing brass to the island the week of Oct. 6th. 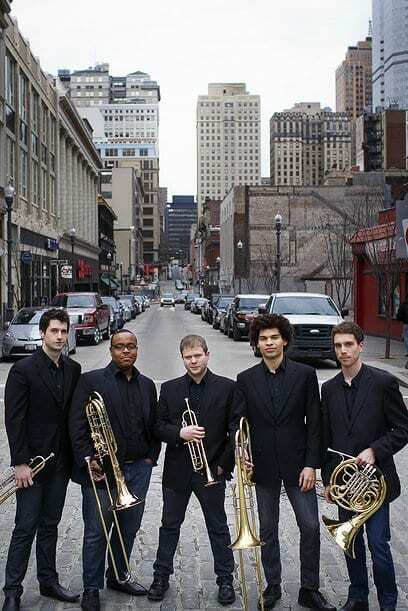 C Street Brass is the Ensemble in Residence at Carnegie Mellon University in Pittsburgh, Pennsylvania, playing trumpets, horns and trombones. This dynamic quintet will lead educational workshops and entertain with ensemble performances as part of the Festival’s Musician-in-Residence program. During the day, C Street Brass will be coaching students at Orcas elementary, middle and high schools, counseling with school music teachers and presenting spirit school assemblies in school and at Orcas Center. The group will continue to coach and perform at night, too. On Monday, Oct. 7th at 7pm, C Street will take part in the Community Band rehearsal, with a focus on coaching brass members. On Thursday, Oct. 10th there will be a Brass Master Class with Orcas Island’s Turtleback Brass. Other island brass players are welcome to join this session. If interested, please call the OICMF Office 376-6636. On Friday, Oct. 11th, there will be a special concert at The Grange, “Classy Brass: A Chamber Music Festival Community Concert.” The program is at 7:00 pm, followed by a post-concert coffee bar reception. Tickets are $15, $10 students 18 and under. To reserve your seat for this exciting concert, call OICMF 376-6636 or email joyce@oicmf.org. 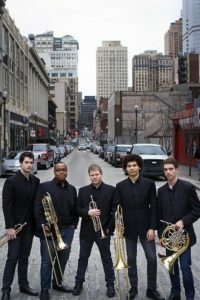 C Street Brass performs classical, jazz, commercial, and chamber music – and you can hear them online at www.cstreetbrass.com. 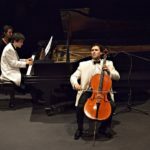 They have appeared in chamber music series across the country, and toured internationally in Tbilisi, Georgia as Resident ensemble of the Traveling Notes Music Festival and in Doha, Qatar as ambassadors for Carnegie Mellon University. The quintet has received outreach and community education training from violinist and educator Monique Mead, who Orcas students and audiences know well as OICMF’s popular Musician-in-Residence and Festival performer. C Street Brass is teaching and performing on Orcas thanks to a Music Education Sponsorship from the following donors: Bill Anders, Janet Ketcham, James Connell and Win Rhodes. The 2013 Orcas Island Chamber Music Festival was filled with superstar musicians … and two young musicians who are well on their way to superstar status! 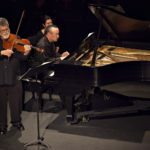 renowned pianist Jeffrey Kahane, international violin soloist Joseph Swensen and New York Philharmonic Principal Cellist Carter Brey, performing classics by Mozart, Ravel and Brahms. Then came the arrival of two artists that were new to the Festival. Orcas audiences affectionately referred to them as the “Bulgarian Boys,” even though they’re hardly boys and have been performing internationally for years. 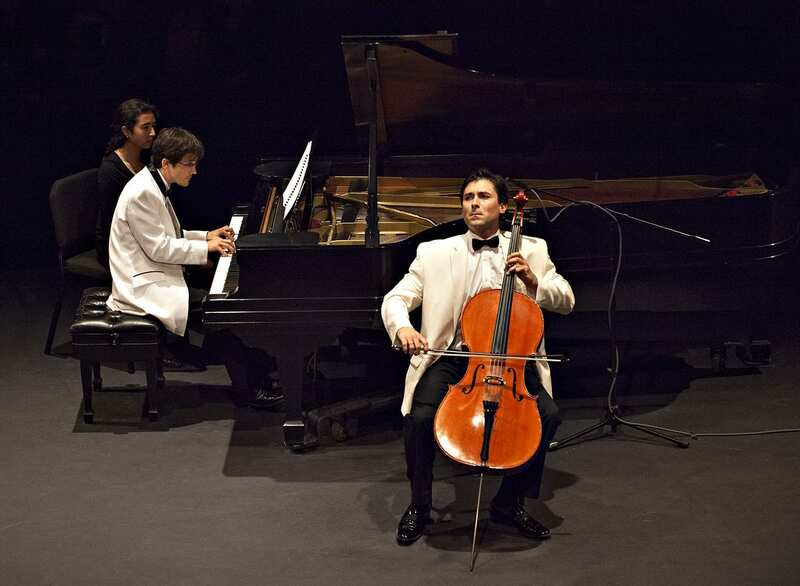 Pianist Viktor Valkov and cellist Lachezar Kostov had adoring fans leaping to their feet. 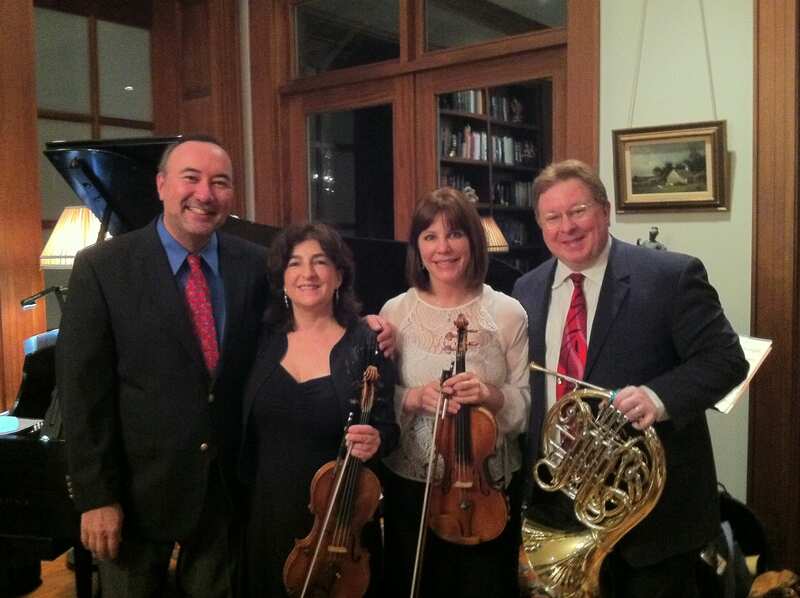 Artistic Director Aloysia Friedmann, viola, and Artistic Advisor Jon Kimura Parker, piano, were excited to welcome a host of superb musicians: violinists William Preucil, Martin Chalifour, Margaret Batjer, Stephanie Sant’Ambrogio and Alexandra Preucil; violist Toby Appel; and cellist Eric Kim. The 16th Season was spectacular! Thank you to the musicians for their amazing performances, and to our loyal patrons and supporters who make it possible. 4 Friends, 1 Hot Summer Ticket! 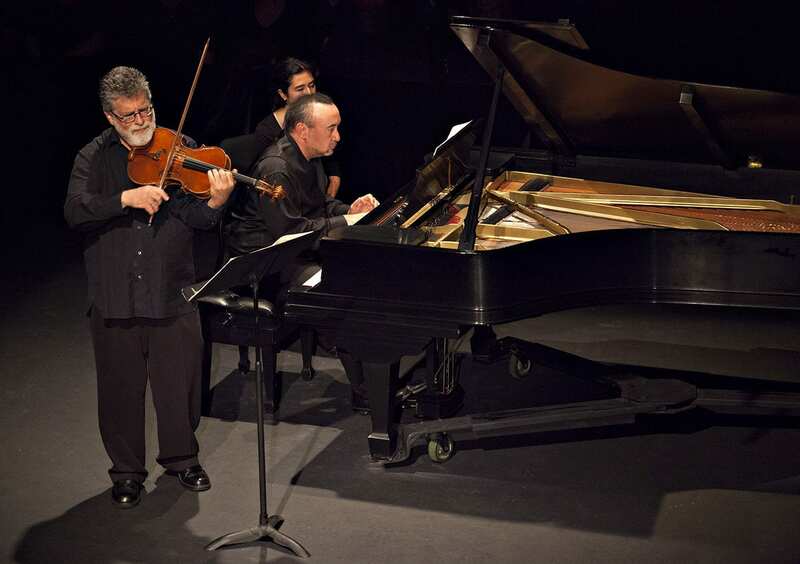 Just weeks before the 16th Annual Orcas Island Chamber Music Festival, four friends will perform an intimate Salon Concert. 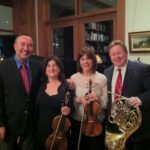 On Tuesday, July 23rd at 6:00 pm, horn virtuoso William VerMeulen and his wife, violinist Sylvia VerMeulen, will join friends Aloysia Friedmann, violist and Artistic Director of the Orcas Island Chamber Music Festival and Jon Kimura Parker, pianist and Artistic Advisor, for a very special evening. The concert will take place in a private home in Deer Harbor, featuring an elegant music room with incredible acoustics. William has been Principal Horn of the Houston Symphony since 1990, as well asperforming as guest Principal Horn of the Los Angeles Philharmonic, Cincinnati Symphony, St. Louis Symphony and others. In Tune magazine says “the horn playing of William VerMeulen is miraculous! …clearly one of today’s superstars of the international brass scene.” Sylvia is a violinist with the Houston Grand Opera and the Houston Ballet orchestras, as well as the Sun Valley Summer Symphony. We’re excited for the return of the VerMeulens, who last performed in the 2007 Orcas Island Chamber Music Festival. Together, with Jackie Parker and Aloysia Friedmann, this foursome promises to be one hot summer ticket! Seating is limited to 35, so please don’t delay in reserving your special spot!